A&A Asphalt can create a beautiful Tar and Chip Driveway for your home. We service Metro Atlanta and surrounding areas. Tar & Chip Paving, also known as Chipseal, is a cost effective, yet attractive, driveway paving option. The Tar & Chip method combines asphalt and stone to create a textured hard surface. The end result is a driveway that provides more texture, giving the look and feel of traditional gravel but is much stronger and durable and will blend with the natural surroundings. With this method, you can use the simple stone or go for a more decorative stone. You can be creative and choose from a variety of colors and shapes for your stones. Tan, red and brown are very popular colors for stone and could make for an interesting color pallet. The tar and chip driveway surface has a classic, rustic and aesthetic quality, giving your driveway all the great benefits of other surfaces, but with a greater aesthetic quality. This types of driveway is often installed for the added beauty it can bring to any home. It can resolve both the aesthetic and cost for your new driveway. 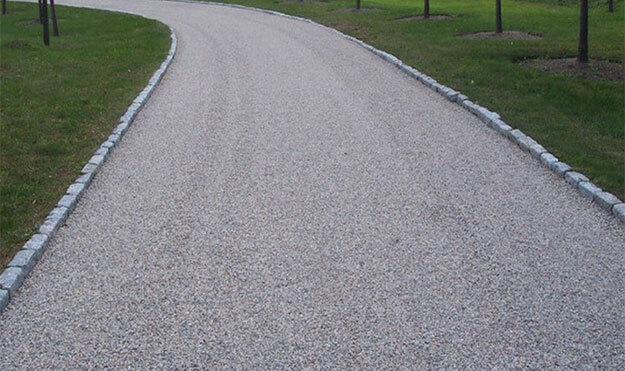 Most people choose a tar and chip driveway for its great quality. This paving method was pioneered in the early 1800s by John McAdams as an effective and economical construction of roadways. Today, we use the same concept to provide an option to standard asphalt driveways. There is no regular maintenance required of a tar and chip driveway. Unlike asphalt, it doesn’t have to be sealed every two years. You can expect the surface to remain sounds from 7 to 10 years and at that point, you may consider another layer of tar and chip.